I have just started experimenting with this wonderful tangy root vegetable. Also known as celery root or knob celery, it is, indeed, knobby. I see them in winter in my markets: large, warty, dusty with dirt…they seem rather off-putting. But really, it’s just a matter of aggressively cutting off the tough skin and brown parts, not just peeling, which rarely does the trick. The creamy white interior is great for all kinds of applications, similar to how you would use a potato (except it is lower in starch), like boiled and mashed, or roasted, in gratins, or made into a gnocchi or a cream soup, but it is also wonderful raw, sliced thin and served as a salad. The Germans make an apple, walnut, and vinegar salad with it, the French a slaw with mayonnaise. I really started loving it when Neni turned me on to her Braised Celery Root and Potatoes (her recipe is in the Greek Kitchen Ecosystem column on this blog). Since I often make the dish just for two, I end up using only half a bulb. The other half…well, leftover stuff is the mother of invention in cooking isn’t it? Celeriac holds well in the fridge wrapped in plastic for a month or so, as long as it doesn’t dry out. 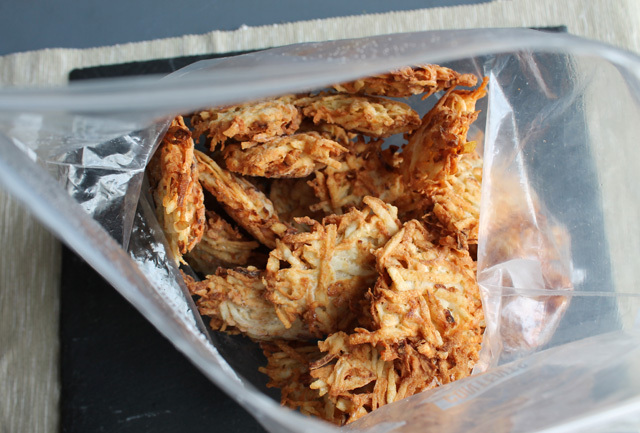 There is about 1 cup to every ¼ pound of sliced or shredded celeriac. To avoid discoloration, soak peeled celery in water with a squeeze of lemon juice in it or a teaspoon of ascorbic acid. Be careful not to overcook or celery root can become mushy. 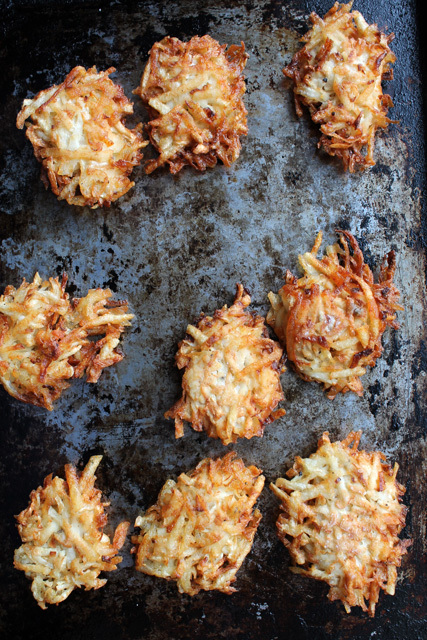 These are delicious, easy, and freeze beautifully. I served them with a little smear of goat cheese on top as an appetizer, and another night, with a grilled flank steak. Excellent! Peel the celery root and place in a bowl of cold water. In a small bowl combine the flour, baking powder, and seasoning and set aside. Grate the potatoes and the celery root on the large holes of a grater. Long grated pieces are best. Place the grated potatoes and celery root in a large bowl and add the onions. Toss well. Add the dry ingredients and toss well, breaking up the clumps. This may take a bit of time, as the dry ingredients must be well distributed. Add the eggs and combine well. Heat about 1 inch of oil in a nonstick frying pan over a high heat. Test the heat by inserting a little piece of potato/celery root in the oil. If it bubbles violently, the oil is ready. Using a slotted spoon, scoop up a spoonful of the potato/celery root mixture, allowing excess liquid to drain off. Drop the spoonful of mixture into the oil. Fry for about 2 minutes on each side, until they are just golden. Do not flip over a pancake until it is golden on the downside, otherwise they will fall apart and may be greasy. They will not be cooked through. It’s okay. Drain on brown paper or paper towels. Continue with the rest of the potato/celery root mixture. As you get toward the bottom of the bowl the potatoes will be wetter. They will take a bit of pressing to remove the extra liquid, and will take a bit longer to cook. At this point you can refrigerate the pancakes for a few days, or freeze them for up to two months. To serve, preheat the oven to 350°F. Place the pancakes on a baking tray and cook for about 10 minutes on each side. They will turn a rich golden brown. They may need to be blotted on a paper towel before serving. I love to use this gnarled root to make soup. The soup is sort of anold fashioned cream sort of an affari, and I serve it at the holidays, accompanied by great discussion of celery root. I have finally figured out that I have to have an extra one, left aside, for show and tell! I have to try your pancakes. They sound wonderful. Adri, I hope you like them! I think they are really tasty. I just ate a handful that I’d frozen. No degradation of flavor at all! I still have a dozen more that I am saving for a dinner party. Thought I’d get wasabi caviar from Russ and Daughters (it’s pretty reasonable–just flying fish roe inundated with wasabi) and serve it on top. 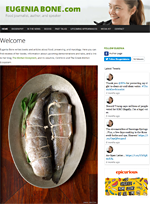 Eugenia, happy to see your new blog and looking forward to the publication of your new cookbook. Hi Caroline: Thanks! 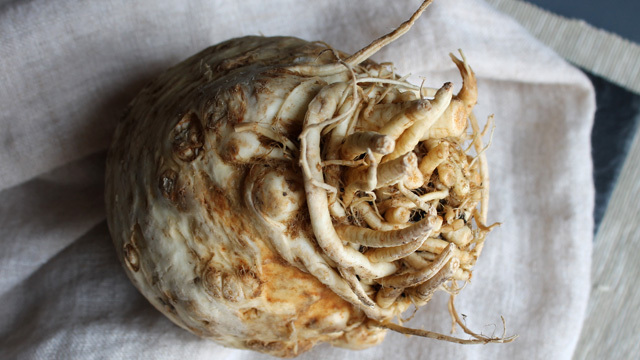 In the recipes I call for celery root (versus celeriac) since it is the more common of the two names. Sorry for the confusion! Now it’s my turn to apologize for the confusion. I meant to say that, if you read over your instructions, you mention potato, but not celeriac/celery root. Oh my, you are so right! I just made the corrections. Thanks!!! 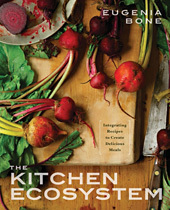 Thank for the correction, since I am definitely going to try this recipe once my CSA starts producing celery root this summer.